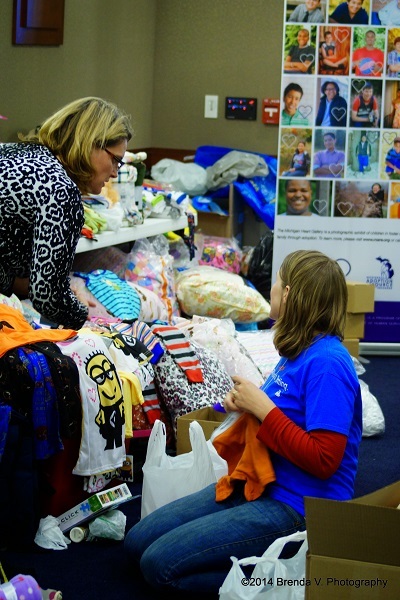 Delegates to the 2014 fall mission center conference at Saginaw Valley State University were asked to bring donations for local foster care and adoption agencies that would allow case workers to create “first night in care” packages that might be needed for youth who are removed from a home. The generosity of many congregations and individuals resulted in an impressive collection of blankets, clothes, toys, pillows, toothbrushes, toothpaste, personal care items, backpacks, and more. Representatives from Midland, Bay, and Saginaw County Department of Human Services (DHS) offices came to collect the items at the close of the conference on Sunday. All of the counties were very appreciative of many items that were donated. Click the link below to read a letter of thanks from Midland County. A focus on collecting items for youth in foster care was chosen for the conference mission project because November is National Adoption Awareness Month. 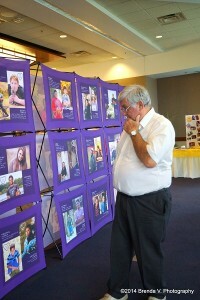 The traveling Heart Gallery exhibit from the Michigan Adoption Resource Exchange was on display at the conference. Delegates were able to view the photographs and biographical information of the children in Michigan waiting for an adoptive family. DHS licensing workers graciously staffed a display table at the conference to answer questions about becoming a foster or adoptive parent. Stephanie McCann from the DHS Faith Based Initiative was also on hand to provide information on how faith communities can support youth and families involved with foster care and adoption through ministries in their congregations. You can learn more about the DHS Faith Based Initiative at www.michigan.gov/faith. To learn more about other foster care ministries around Michigan and stay connected with updates you can join a local Faith Communities Coalition on Foster Care. Find out about local meetings and sign-up for e-mail updates at www.faithcommunitiescoalition.org.